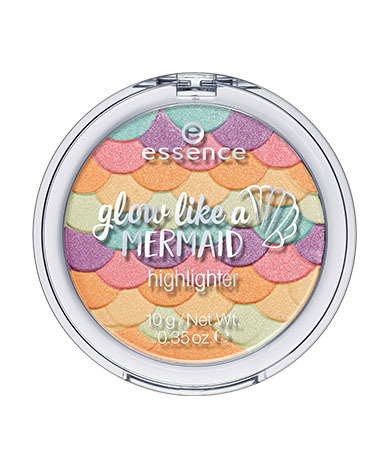 glow like a mermaid highlighter has a rating of 5.0 stars based on 8 reviews. "INGREDIENTS: MICA, TALC, MAGNESIUM STEARATE, DIMETHICONE, ETHYLHEXYL PALMITATE, POLYISOBUTENE, SYNTHETIC WAX, PARAFFINUM LIQUIDUM (MINERAL OIL), TIN OXIDE, ETHYLHEXYLGLYCERIN, PHENOXYETHANOL, MAY CONTAIN/ [+/-]: CI 15850 (RED 6 LAKE), CI 19140 (YELLOW 5 LAKE), CI 77007 (ULTRAMARINES), CI 77491, CI 77492, CI 77499 (IRON OXIDES), CI 77510 (FERRIC AMMONIUM FERROCYANIDE), CI 77891 (TITANIUM DIOXIDE). AND/UND INGREDIENTS: MICA, TALC, MAGNESIUM STEARATE, DIMETHICONE, ETHYLHEXYL PALMITATE, POLYISOBUTENE, SYNTHETIC WAX, PARAFFINUM LIQUIDUM (MINERAL OIL), ETHYLHEXYLGLYCERIN, TIN OXIDE, PHENOXYETHANOL, MAY CONTAIN/ [+/-]: CI 15850 (RED 7 LAKE), CI 19140 (YELLOW 5 LAKE), CI 77510 (FERRIC AMMONIUM FERROCYANIDE), CI 77891 (TITANIUM DIOXIDE)."